To create or edit templates used for Giving Statements, navigate to Settings and once the page loads, click on Financial. From here, click on the ‘Giving Statement Templates’ tab. Once on this page, you have the option to either select an existing template or create a new one. Once you have selected a template to edit, you have the option to edit the information that appears in the various areas of the giving statement. To edit the layout of the page, click the Setup tab. 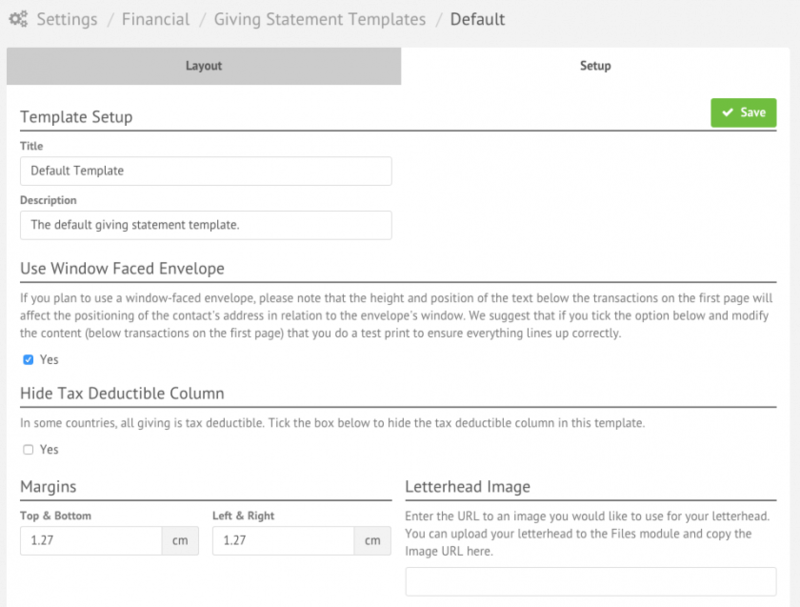 This will load a window that allows you to change the layout of the giving statement (see below). This includes printer margins, and header/footer sizes, as well any letterheads that are to be used in the statements. These settings are for how large the different areas of the giving statement should be. It’s important to consider that these areas need to be large enough to hold all the data that you want to include in them. Below is an image describing the locations of the different areas the settings window above describes. To view how the template will look when you generate giving statements, close the window, and press the ‘Preview Giving Statement’. This generates a sample giving statement using the template.